On this, the fourth week of the 2017 HPR Cocktail Showdown, we return to visit a previous contender and welcome a new one. Heading back Downtown for this week’s judging, we first sat down at the newly renamed Zest Lounge inside the Radisson Hotel Fargo, where Vince Kramer was excited to toss his hat in the ring for a first-time appearance in the Cocktail Showdown. We then paid a visit to the Boiler Room and returning contender Josh Goedtke, who made a very strong showing in both the Cocktail Showdown and the Bartender’s Battle last year. Under new ownership and with a rebranded restaurant next door on the second level of the Radisson in Downtown Fargo, Zest Lounge is open from 4 to midnight Monday through Thursday. On Fridays they have extended their hours from 3pm to 1am. Saturdays they open at 11am and close at 1am while Sundays they are available from 11am to 11pm. Wednesday they present a wine special, featuring $2 off per glass or half off bottles of wine. The food menu from the restaurant features a mix of artisan pizzas, burgers, sliders, salads, and wraps, as well as a variety of appetizers. On Sundays, the lounge plays host to a breakfast buffet from 9am to 2pm. 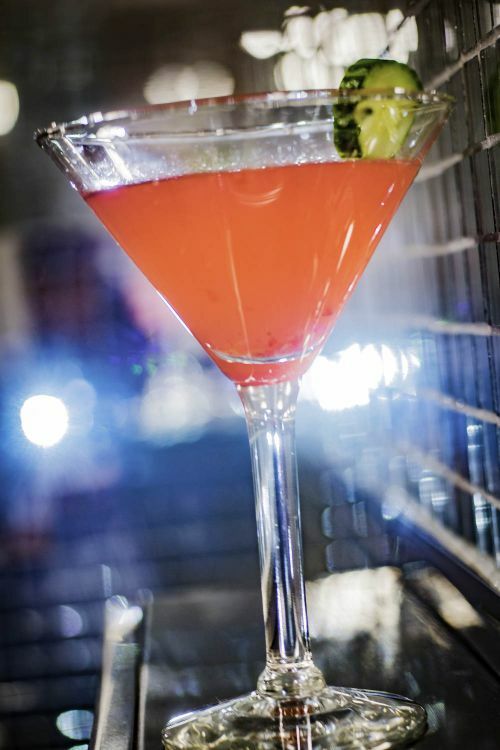 Vince began this cocktail by filling a martini glass with ice and water to chill it while he filled a shaker with a mixture of raspberries, cucumber rinds and simple syrup. After muddling well, he added some more simple syrup and Tito’s vodka before shaking well. He then dumped the ice water from the martini glasses and strained the contents of the shaker into the glass before garnishing with a simple thick cucumber wheel. The nose was a flash of cucumber freshness and faint berry aromas. Conversely, the taste delivered the tart and fresh berry flavor in the forefront but the cucumber crispness provides a nice faint background. Created with his grandmother’s garden in mind, this cocktail is loaded with simple but fresh flavors. Vince’s take on the old school caramel apple sucker is what he offered up as a sweet treat for the fall season. 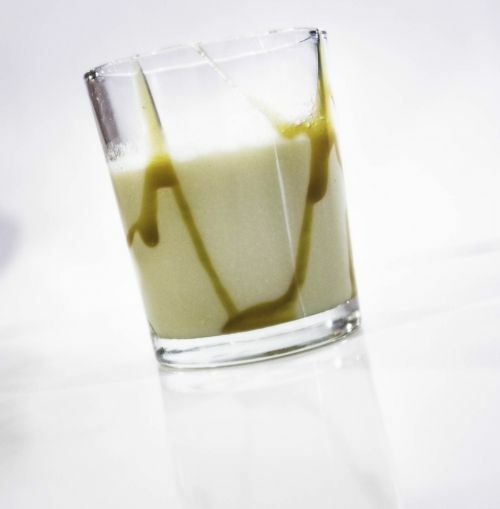 He poured Dekuyper Sour Apple Pucker and Bailey’s Salted Caramel into a shaker filled with ice and then shook the mixture vigorously. He then drew some thin ribbons of Smucker’s caramel topping inside shot glasses before straining the mixture into them. The salted caramel and irish cream deliver the sweetness and coat the palate much like the caramel coating on those tart apple suckers from the days of our youth. Beginning with breakfast and continuing all the way through to their late night menu, The Boiler Room offers modern takes on nostalgic comfort foods. Their Rum Chata french toast is always worth mentioning, and the lunch, dinner, and all-day menus feature a wide variety of options, including Shepherd’s Pie, Fish and Chips, Scotch Eggs, several burgers and sandwiches, and Crab-Stuffed Walleye. Their tap list is heavy on local and regional craft brews, and the drink menu features modern craft cocktails and old-fashioned classics, some of which were created by this year’s returning contestant, Josh Goedtke. Josh used Novo Fogo Silver Cachaça and Plantation Pineapple-infused rum in this tribute to the tropical rainforest country it is named for. In a shaker with ice he added the spirits to some banana puree, peach puree, a splash of fresh lime juice and a touch of agave nectar. It was shaken well and strained into a rocks glass with ice. The drink was then garnished with a thin slice of banana and a thin slice of mango on a pick. 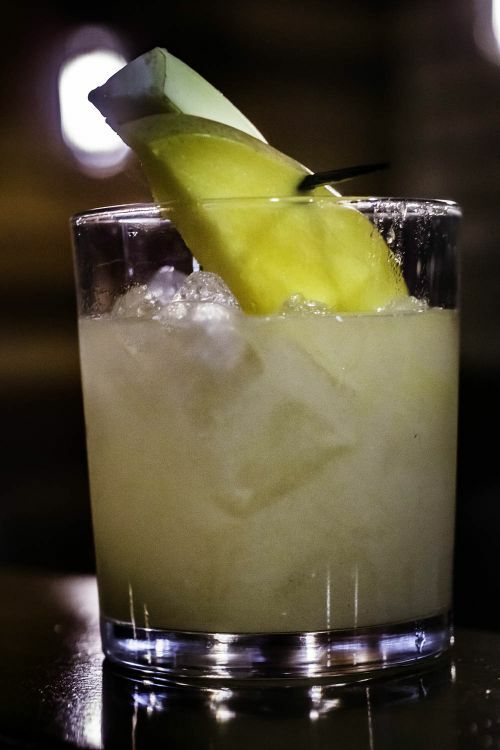 The lovely banana and pineapple notes from the Novo Fogo were accentuated by the peach puree without being overpowered, in part due to the right touch of banana puree. The delicate floral notes were more present than I expected with all that great fresh fruit puree. As Josh was chilling martini glasses, he sat the ingredients of this drink on the bar in front of us and I had an immediate and almost Pavlovian response. Stetson Bourbon, Licor 43, Tattersall Blackberry, Talisker Storm, Fee Brothers peach bitters and Fee Brothers black walnut bitters delivered visions of dark, rich flavors that began to tantalize me. Josh began with a shaker with ice and a heavy pour of the Stetson Bourbon before adding in the rest of the ingredients except the Talisker Storm, which he used as a wash on the glass. The contents of his tins were shaken and strained into the martini glass. A jar of “boozeberries” (blueberries soaked in Talisker Storm and simple syrup for 24 hours) was pulled opened and he dropped several small blueberry treats into the bottom of each glass before serving. 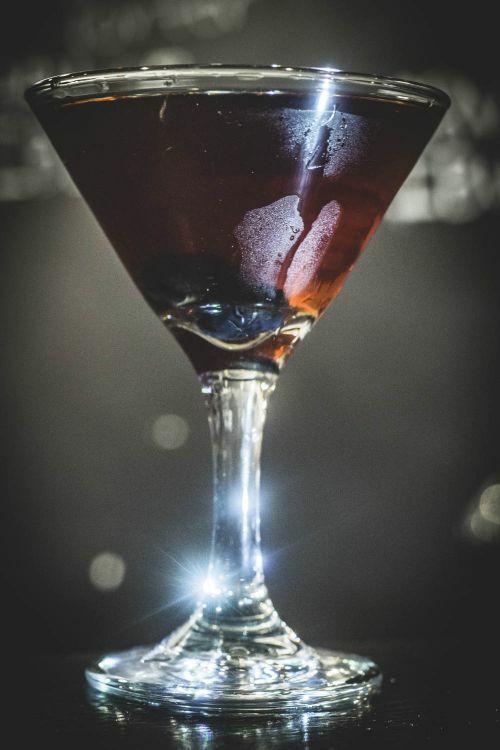 The result of numerous experiments with the classic Godfather Cocktail, this elegant and decadent after-dinner treat had me thinking blueberry whiskey truffle. The sweetness was tempered perfectly by the smoke and tart berry, and the boozeberries at the bottom of the glass brought the smoky scotch forward in a way that whiskey lovers would delight in.